A leading supplier of medical equipment has specified Rigel Medical’s 62353 safety analyser to improve the electrical testing of its powered operating room tables. TRUMPF Medical Systems Ltd, based in Luton, manufactures and supplies operating room tables to hospitals and healthcare facilities across the UK. These have to be regularly tested to ensure compliance with IEC 62353, the standard for in-service and after repair testing of medical electronic devices. 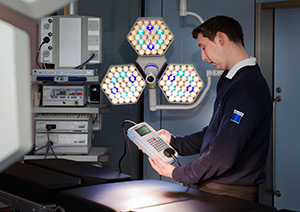 Using the Rigel 62353 enables the nationwide team of field service engineers to carry out electrical safety testing to ensure the operating tables are safe for use by both patients and staff. This means that important electrical safety tests are being undertaken as an integral part of TRUMPF’s aftersales support, saving time and boosting customer service levels. Five units have been specified by TRUMPF’s UK operation, combining the benefits of an automatic and manual tester with advanced data logging to provide improved asset management capability. Additional units have been supplied to the company’s head office in Germany, reflecting strong demand for Rigel products in important European markets. Alasdair Owen, service manager for TRUMPF Medical Systems Ltd, said the Rigel 62353 was an excellent instrument which has been easy to integrate into the engineering maintenance schedule. He added: “The Rigel 62353 enables us to comply properly with the requirements of the European standard for in service testing of products. “It’s a very intuitive instrument, offering a single-button test solution which engineers, who have busy service schedules to complete, really appreciate. “This means that they don’t have to stay on site any longer than absolutely necessary, avoiding any inconvenience to hospital staff and services. It is the first analyser of its type offering automatic sequencing, onboard data storage and data entry in a lightweight, easy-to-carry enclosure. Improved battery power provides extended operating life while the instrument’s lightweight feature makes it extremely practical and easy-to-transport from site-to-site. It can store and manage thousands of test records - highly beneficial to field service engineers moving quickly from site-to-site. Also, the capacity to customise test routines, visual inspections and performance tests, which can be downloaded to and from a PC, improves in-service testing capacity. Other features include an easy-to-use facility for testing up to two individual Applied Parts from different modules or classes e.g. BF and CF class and either fully automatic, semi automatic or manual testing. A full graphic LCD display has been incorporated with an integral alpha-numeric ABCD keyboard for quick and accurate operation. The analyser can be connected to Rigel’s Med-eBase PC database software to provide enhanced electronic recording and management of testing programmes. Custom test routines can be created for testing specific medical devices before being uploaded to the analyser. Med-eBase verifies the status of electrical medical equipment in line with IEC 60601-1 and the new IEC62353 in-service safety testing standard. Test results can be stored on a local or remote database depending on the needs of individual biomedical service departments, enabling quick and easy access for service technicians and engineers via PCs. See how the Rigel 62353 Hand-held Electrical Safety Analyser can improve your business and request a demonstration today.